Welcome to the our links page. This page is designed for your enjoyment. 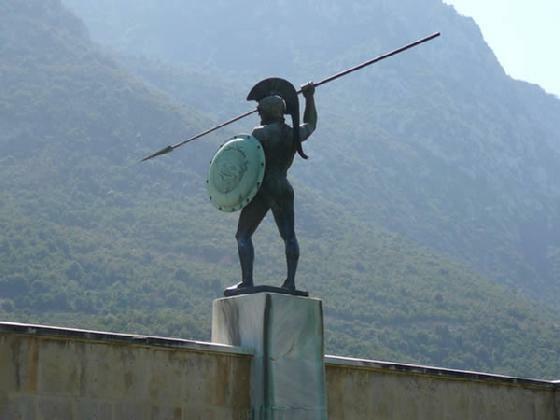 It brings you to websites that touch on the many aspects related to ancient Greek warriors. These websites include: Other Greek warrior re-enactor groups, places to buy Greek armor, novels about ancient Greece, ancient Greek art which includes pottery and statues, artisans who have created art to commemorate ancient Greece, traveling in Greece (travel the streets of Athens), museum websites with ancient Greek artifacts, and more. Scroll down the page to find a link that may interest you. Manning Imperial - www.manningimperial.com - Craig Sitch, Box 27 Redan, Victoria Australia 3350 - Quite frankly we love them the best. Craig is a master craftsman with everything from ancient to modern in arms and armor, all made by him. Cherilyn runs the business, and they make Manning Imperial the premier arms and armor supplier. Kult of Athena - www.kultofathena.com - Kult of Athena has some of the best prices around with quality arms and armor. Speak to our friend Ryan if you phone them, or order directly on line. The Greek Warriors do quite a bit of business with Kult of Athena. Tell them The Greek Warriors set you! Minamoto Armouries - www.heikiko.com or www.geocities.com/minamoto_armouries/ - Joe from Minamoto makes fine Linothorax armor from either linen or leather. Joe and his partner also make fantastic leather armor from various eras, but his forte is Japanese Samurai armor. Great prices, great to work with. Tell Joe that The Greek Warriors sent you. We have several sets of greaves and armor that Joe made for us, and his craftmanship is of the highest quality. Bowhair.com - www.bowhair.com - British Columbia, Canada - Call 250-247-8030 - Michael Vann , The finiest quality horse hair in one pound bundles. High quality horse hair for violin bows or crafts. We use Michael's horse hair for our helmet crests. Great prices. Michael also makes premier violin bows. Scott Lobaido - www.scottlobaidostudio.com and www.creativepartiot.org - Scott is an artist who painted the figures on our Eagle and Athena shields. He paints everything from canvas art all the way to entire buildings. Bill, pictured here in armor he made for himself and can also make for you, is also a member of The Greek Warriors - He makes Linothorax armor the finest that we have ever seen. Made of Leather, Cloth, Bronze Scales, and Decorated true to the ancient Greeks, Bill has captured the very essence of the Linothorax. His work is of fine detail and they are beautiful works of art. 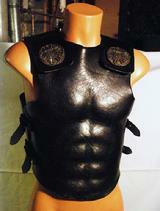 Being an artist, Bill has applied all of his skills to make stunning ancient Greek armor. You owe is to yourself to invest in one of his masterpieces to truly look like a Greek Hoplite. While on his website enjoy his stunning artwork. Gwen Minor, stories from the Ancient world – We came upon Gwen Minor’s website, which is a terrific educational and reference website. Gwen is an author who has made a number of trips to do her research. The website is full of great reference material for teachers, students, and anyone interested. Gwen provides writing and educational services and I’m sure you would love to attend one of her lectures or group workshops. Plus Gwen was kind enough to mention The Greek Warriors in her website as well. Matthew Amt’s Greek Hoplite Page – www.larp.com/hoplite/ Matthew has spawned many of us with detailed instructions on how to make shields, crests, do metal work, leather work, etc…. Matthew has helped the Greek Warriors to be what they are today. John Trikeriotis hosts these two web pages with all you would like to know about the hero Spartan King and his 300 warriors. The Warriors of Greece – www.warriorsofgreece.com - Chris Panagalos, a former Marine from Charlotte, North Carolina runs this premier Greek Hoplite Re-enactment group. Chris makes a great Spartan commander and his group shines as a beacon for his area of the country. The Ancient Hoplikiton of Melbourne – www.ancienthoplikiton.com - The group is located in Melbourne, Victoria, Australia. They are a premier Ancient Classical and Hellenistic Greek re-enactment group of the highest quality. Their commander, Athanasios has appeared on magazine covers as a Spartan officer. He looks the part indeed! The Sydney Ancients – www.sydneyancients.5u.com - The group, located in Australia, focuses on Classical Greece, Early Republican Rome and 1st Century Imperial Rome. Their Hoplite group has been an influence for others around the world. Hoplites Mores – www.spartasmores.gr - A Greek Hoplite re-enactment group from Greece. They look great and were recently in a show called Warriors, with Terry Schappert. We are proud of this group. Thank you guys. The Hoplite Association and 4Hoplites – www.hoplites.org and www.4hoplites.com The British are also experts at being Greek warriors. They look to be the first group to get us all started. The 4Hoplites web-page gives great advice on assembling a panoply for yourself. Hoplites of Athena – www.hoplitesofathena.com - Our sister group located in Albuquerque, New Mexico. Great website with nice photos of the group’s members. Nicely constructed website. Spartan and Amazon Warriors – www.spartanandamazonwarriors.com - The name speaks for itself. Spartans and Amazons. Great stuff. Located in western Pennsylvania. Hoplite Group – http://hetairoi.de - A fine group of Greek Hoplite re-enactors from Germany. Aris, the director of greekjewelryshop.com as contacted us and we are pleased to have his website on our links page. All of their jewelry has an ancient Greece theme and they are all beautifully crafted pieces. 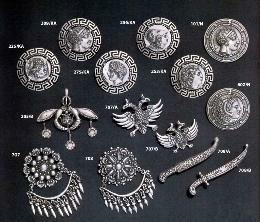 You can get rings, pendants, earrings, bracelets, brooches, all designed with the beauty of ancient Greece. Please visit their website and please buy. Just looking through their website will impress you. We highly recommend them. Greek artwork, jewelry, religious items and more. Enjoy these links to decorate your home and yourself! Hellenic-Art.com - www.hellenic-art.com - "The premier source for genuine Greek treasures on the Net" .... Ancient Greek sculptures, Byzantine Greek Orthodox Icons, Ancient Greek Pottery, Ancient Greek Armour, Byzantine Oil Lamps, Chalices,etc., Ancient Greek 14K Gold Jewelry - Decorate you home and yourself like a true Greek! Art-from Greece.com - www.artfromgreece.com - Another source of fine Greek art:statuary, pottery, friezes, frescoes and more! Again, decorate your home and yourself like a true Greek! Metropolitan Museum of Art - www.metmuseum.org - You must visit the Met. Their collections stemming from ancient to modern are breathtaking. Visit the new Greek galleries. There are vases, statues, friezes and more. And a special thanks to our wives, who have been a great support and such a great help. I recently saw a movie and one of the characters in the movie stated: "Where would we be without our wives�. I know that I am in a better place because of mine. Joni has been a help and a support for me and The Greek Warriors, and this website and group would not be as good without her support and help. Our home is full of Greek shields, and the garage is full of boxes of armor. The house has tools to make this stuff all over the place. I drag her around to our events, and most of the pictures in this website were taken by Joni. She is very much a part of this group and I could not do what I do without her. Thank you Joni for being the best in a wife that any man could ask for, and for being a support in what has become a passion for me. But you are my greatest passion.